The first locally produced Irish coinage was the so-called Hiberno-Norse coinage which was first minted in Dublin in about 995-7 AD under the authority of Sihtric III (aka Sihtric Silkenbeard), the Norse King of Dublin. There is no evidence for the native Irish producing coins before this, so it is likely that their economy was not coin-based. The Brehon Laws give examples of payments and compensation via services, indenture and/or property but they do not mention units of currency for economic transactions. Why were Viking coins produced ? The Vikings were raiders and traders – and the ‘trading’ Vikings needed units of ‘acceptable’ currency for trading. They traded with many different tribes and cultures, some of which had coins, e.g. the Arabic dirham was widely traded at the time, as were the Anglo-Saxon and Carolingian pennies. A problem arose with these ‘foreign’ coins insofar as the Arabic dirhams fluctuated from 95% silver (before 950 AD) to around 60% silver by the end of the 10th C (Steuer, 2002, 154-55). On the other hand, German and English coins remained stable at approx. 90% silver (Steuer 2002, 146; Zwicker et al. 1991). Hack silver in the form of foreign coins was difficult to value, and the hack silver itself was of such different shapes, sizes and weights, it was also difficult to value. How did the Vikings progress from a ‘bullion’ economy to a domestic ‘coin-based’ economy? 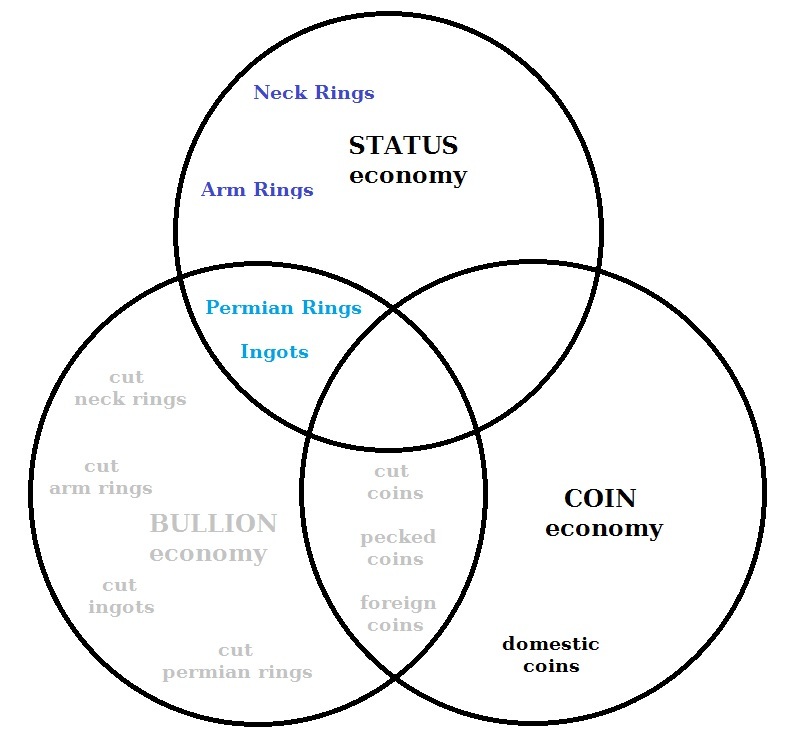 a) The ‘linear’ model for Viking‐age economies whereby the status economy is replaced by a bullion economy, and then a coin‐based economy, with some overlap in each transition. At first a status economy exists in a Viking society, in which ‘high value’ ornaments such as neck rings and arm rings, and perhaps brooches or other jewellery, are used as decorative objects as well as the storage and display of wealth. This is followed by the transition to a bullion economy in which these ornamental objects are replaced by weight-adjusted ornaments such as ‘Permian’ rings which are decorative items made to a set weight, or series of set weights, which meant that not only were these status objects ‘wearable’ and a ‘store of wealth’, but also that this store of wealth was ‘standardised’ and the owner / wearer of the rings knew the exact value of their ornaments. The use of ingots is seen as the next stage in this development as they are standardised weights with specific values of metal but lack the ornamental function of ‘high status’ jewellery or ornamental items. The bullion economy is identified by the presence of ‘hack silver’ which can be made from cut ornaments, cut ingots or cut coins and/or foreign coins. It is the use of cut coins as ‘hack silver’ which heralds the start of a transitional phase towards a domestic coin-based economy. This is followed by the use of coins which were not produced by the Viking-age society using them, which have been classified here as foreign coins. In the transitional phase both cut and foreign coins are often tested to judge their silver quality and fineness. This testing can take the form of pecking, bending or edge-nicking – all of which allow the buyer to assess their worth. Finally, the leaders in the Viking society realise the benefits of a coin-based economy and begin to produce their own domestic currency in the form of coins, which will be used by the general population within that society. If these locally-produced coins are to be traded internationally, they need to be similar in value, weight and metal content to their foreign contemporaries. As domestic and overseas ‘trust’ develops, local design variances can occur – eventually a distinctive local coinage develops. This results in an increase in economic power or economic influence of the issuer. Local authorities (rulers) can then embellish their coins with their own designs – provided the value, weight and metal content remains constant. Failure to do so will result in their coins becoming less desirable (lower value) in the eyes of overseas traders. b) The ‘simultaneous’ model for Viking‐age economies, in which different economies co-exist and are used for different social and economic functions, with some overlap in these functions. This model does not represent a linear development from a status to a coin-based economy. As with the linear model, finds of ornaments such as arm rings or neck rings show the presence of a status economy. 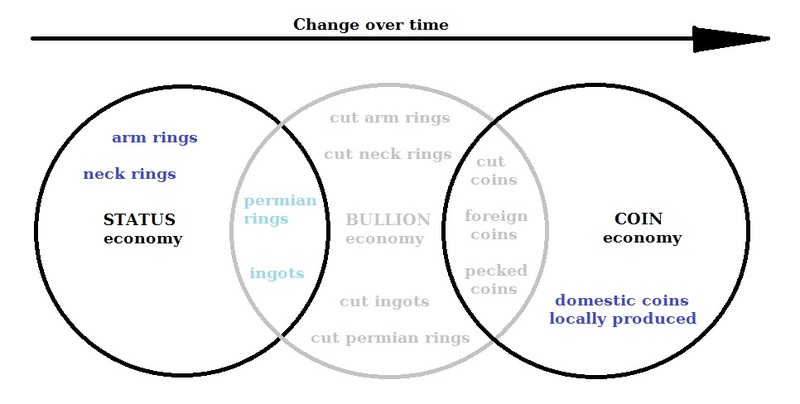 However, where the presence of ingots and ‘Permian’ rings or other weight-adjusted ornaments was seen in the linear model as evidence for the transition from the status to the bullion economy, here these objects represent the intersection of the two types of economy at the same time. In the simultaneous model, all three economic spheres exist together, but the different types of money found in hoards or as single finds represent the different uses of money for different types of goods and services, rather than a chronological difference. Why were Viking coins produced in Dublin ? The Vikings were already producing silver coins in their other Scandinavian colonies such as York, so perhaps the need for money as a means of doing business (trade) with neighbouring Anglo-Saxon kingdoms was a good reason for doing so. Since many of the Viking kings of York were also kings of Dublin, it was inevitable that Dublin would eventually produce its own coinage in order to grow via overseas trade. 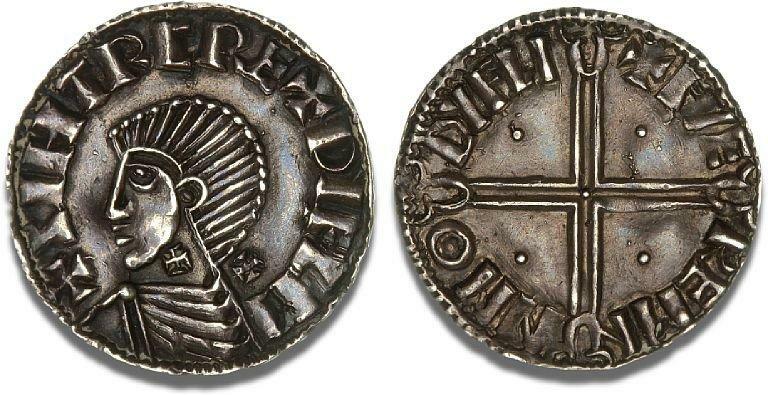 Anglo-Scandinavian coins were also being produced in Sweden and Denmark, presumably also to facilitate trade with the Anglo-Saxons – or was it just an emotive connection to the danegeld formerly paid by the English to halt Viking raids on their kingdoms. These Early Hiberno-Norse coins were good copies of the English pennies of the period (typically of Aethelred II 979-1016 AD). They were not ‘contemporary’ forgeries – the coins of Aethelred were widely recognised throughout Northwestern Europe at the time because of the Viking expansion. Sihtric’s moneyers used these designs to ensure their coins were similarly recognized but, most importantly, the coins were properly signed as coming from Dublin under Sihtric’s authority. After the battle of Clontarf in 1014 Ireland became more isolated from the rest of the regional Viking community and there was a reduced requirement for money as it was the Norse settlers who were the principal traders and made most use of coined money. The three Dublin hoards of the earlier 990s have brought a dramatic revelation that there already existed an effective coin economy based on imported Anglo-Saxon coins. This helps one understand how Sihtric ‘Silkbeard’ could introduce so effectively a new currency based on his own local coinage. With the change of type in England, Sihtric decided to follow suit, and to remint the Crux type with his own version of the Long Cross type. This seems to have been effective, to judge from the scarcity of Dublin Crux coins in Scandinavia and elsewhere. However, the following three issues of Phase I were not struck on the same scale, and they may not have accomplished a renewal of the earlier currency, if indeed that was their goal. The initiatives introducing Phase II in c. 1018 and Phase III in c. 1035 likewise were radical reforms, driven by a desire to raise the weight standard for the coins, to enforce a managed coin economy excluding foreign coins, and to provide a distinctive national identity for the coinage. It should also be remembered that in 1066, the Normans invaded England and quickly displaced all local chieftains with local feudal lords who were given ownership of the land and peasants within its boundaries – provided they could keep it by force of arms ! The strategy of this new type of feudal lord was to eliminate the previous lord (and his family/followers) but keep the peasants to do the work + pay him taxes for his protection (no change for the peasants). He, in turn, paid homage to his overlord (the King) and provided men and equipment for military service if called upon to do so. This had a major impact on Viking farmers and Viking merchants/traders throughout England and would have also impacted on the Irish Vikings in terms of overseas trade. By the time the Cambro-Normans came to Ireland, the Vikings had been somewhat cut off from their continental cousins and the Viking towns of Northern England had been changed utterly by Norman feudal system. It is inevitable that this would have a knock-on effect on the Hiberno-Norse who had already been in decline since the Battle of Clontarf in 1014. By the Early 1100s the coins were either double or single sided bracteates (thin coins where the design on one side appears in reverse on the other). It is difficult to see how the later Hiberno-Norse coins could have really been used as coins given how thin and brittle they are – so it is reasonable to suppose that as the coinage degraded its use become increasingly limited. A decade or two before the Cambro-Normans invasion of Ireland (1169-1170) production had all but ceased – probably by about 1130-1150. From a numismatic point of view, Hiberno-Norse coinage is divided into 7 phases. These phases are chronological and are based on the style of the coinage. Some of the phases and some individual coin types can be dated quite accurately, but most of the coinage can only be dated approximately. The date range and confidence in the dating becomes poorer as the coinage progresses. Individual first phase coins can usually be dated with some confidence to a six year production period – whereas the final seventh phase coins can only be loosely dated to an approximate twenty year period. The Earliest coinage of Ireland comprises an issue of silver pennies under the authority of Sihtric III (a.k.a. Sihtric Silkenbeard) King of Dublin. These pennies follow the style of the contemporary pennies of Aethelred II of England, which changed their design every six years or so. 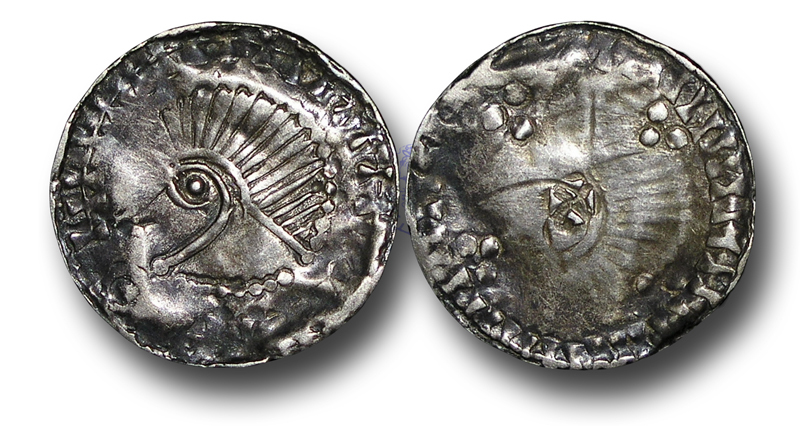 The Irish coins are made of good silver and are usually signed in Sihtric’s name and by a Dublin Moneyer so this is not an attempt at forgery but instead it is a pragmatic approach to produce coins with designs that would be widely acceptable throughout the Viking world. the result of a sharp implement being used to pry the coin from the die after striking. Class ? 1024-1030 Pointed Helmet issue (King Cnut) in the name of Anlaf Sihtricsson – one recently found ! Sihtric III died in 1029 and was succeeded by his son Anlaf Sihtricsson. There is a recently discovered coin (of very good quality) that is in the style of Cnut’s “Pointed Helmet” issue (1024-1030) that carries the name Anlaf and does appear to be a late Phase I Hiberno-Norse coin. The late Mark Blackburn suggested that some of the Hiberno-Norse coins of the later Phase I types were made in Anglo-Saxon mints on behalf of the Dublin authorities, which would be likely explanation of how the later Phase I pieces are from such well executed dies. If it was a ‘prestige’ piece, then no interim Cnut types will be likely be found and the current chronology can remain intact. Future finds (or lack thereof) will tell. Following the end of minting of coins in direct imitation of the contemporary English issue, the mint in Dublin appears to have reverted to minting coins in imitation of the Long Cross issue of Aethelred II in about 1020 AD. The Long Cross type was originally issued between about 1002 and 1008 AD with additional symbols such as pellets, or symbols which have only the appearance of lettering. This is the most common type of Hiberno-Norse coinage and is often seen at auction and in dealers’ inventories. 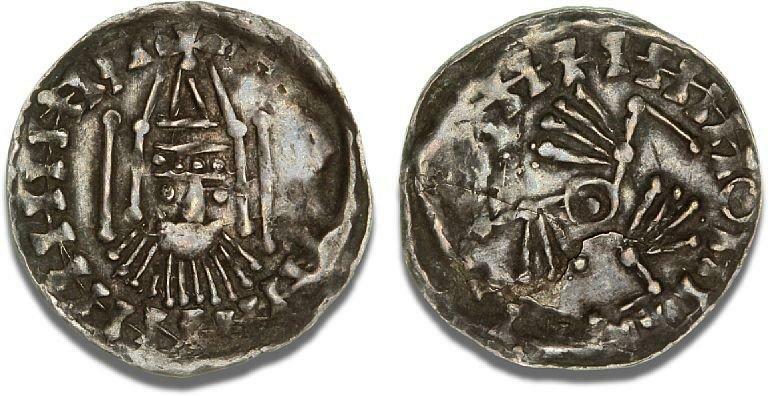 The Dublin Vikings were in decline after the Battle of Clontarf and, by 1035 AD, the coinage minted in Dublin had degraded to a point where it is likely that it was only being produced for internal use within Ireland as it had fallen below the standards used in any neighbouring regions. The coins are smaller and of poorer quality silver, they have legends made up of strokes and symbols rather than lettering, the symbol of the human hand appears on many coins in one or more commonly two quarters of the reverse cross. The so-called ‘scratched die’ coins of Phase IV comprise a small group that could have been included with the following phase. The coins exhibit one common characteristic insofar as they have a cross apparently scratched into one quarter of the reverse die. The two basic designs are derived from the long cross type of Aethelred and from an as yet ‘untraced’ facing bust type. The long cross type is similar to ‘late’ phase III and many Phase V coins – but it is a distinct type nevertheless. The facing bust type is unique to this phase and is easily identifiable as a distinct obverse type. The fifth phase of Hiberno-Norse coins is really a bit of a “dumping ground” for an extensive series of pennies which vary widely in design and which by their general style, production quality and weight appear to have been produced in a period of approximately 40 years between 1060 and 1100 AD. The range of designs is so wide that many of these coins are unique – though there are some common dies and designs which have led numismatists to identify these coins as belonging to a single design / production phase. By about 1100 the Hiberno-Norse coinage settled down into a period of relative stability and a large number of coins of a relatively similar design were produced. These coins had an obverse design which was a degraded form of the Aethelred radiate bust from his ‘long cross’ issue with the addition of a crozier design in front of the face. The reverse feature a pair of sceptres in opposite quarters and the other pair of quarters usually featured a cross or a pellet, or annulet. Phase VI coins were made from a lower grade silver than the previous issues and tend to be darker than the earlier phases. There have been several hoards of these coins found and many individual finds so they tend to be less expensive than all but the phase III coins – as such, they are a good ‘starting point’ for collectors. Phase VI coins are generally unattractive with very poor striking quality and generally dark surfaces which also tends to depress the prices in the marketplace. The Hiberno-Norse series died out sometime between 1130 and 1150 AD with a series of increasingly thin, under-weight and simplistic coins. The first group are double sided with designs derived from the ubiquitous long cross design, but they are generally so thin that the designs from each side are heavily ‘ghosted’ on the other side. These final coins in the series are all quite scarce to very rare and, like Phase V coins, there is a wide variety of designs – many of the individual designs are represented by a single surviving specimen ! This blog post will be followed up with a series of 7 more detailed posts, each one dealing with a single Hiberno-Norse phase. Each of the above posts will be illustrated (as far as possible) with examples from each Phase and sub-Class of coinage. Bateson, J. D., “A Hiberno-Norse Hoard from Dull, Perthshire”, NC 153 (1993), 211-4. Blackburn, M. A. S., “Presidential address 2006. Currency under the Vikings. Part 3: Ireland, Wales, Man and Scotland in the ninth and tenth centuries”, BNJ 77 (2007), 119-49. Blackburn, M. A. S., “Presidential address 2007. Currency under the Vikings. Part 4: The Dublin Coinage c.995-1050″, BNJ 78 (2008), 111-37. Blackburn, M. A. S., & Seaby, W. A. “The “Francis” and “Brand” parcels of Hiberno-Norse coins”, BNJ 46 (1976), 29-38. Dolley, R. H. M., “The 1871 Viking-Age find of silver coins from Mullaghboden as a reflection of Westfalding intervention in Ireland”, Årbok – Universitetets oldsaksamling (Oslo), (1960/1), 49-62. Stewart, I., “A group of Hiberno-Norse pennies”, NCirc 1971, 405-8.